I have to admit there are certain things about woodworking that I enjoy more than others. But like a lot of woodworkers, one of my least favorite jobs is sanding. That's why I'm always looking for a better way to do it. Especially when I'm sanding moldings. When cleaning up moldings (like V-grooves or roundovers) with sandpaper, the problem is getting the sandpaper to conform to the moldings profile. So I needed to find a way to hold the sandpaper to match the shape. The nice thing is, you don't need to buy a detail sander to do this. What I use is a hand sander with interchangeable heads. I make several heads to match different molding profiles, see the photo. To make changing the heads easy, I like to use Velcro strips to attach them to the handle, see the drawing at left. Just stick a piece of the " hook" material to the handle and a piece of "loop" material to the heads. Then attach a piece of self-adhesive sandpaper to the profile edge. 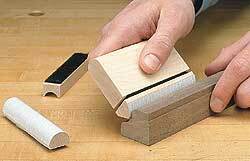 Now you have a handy block that makes profile sanding a lot less tedious.